The first stop of our revised “Farm, Forest and Fishery Tour” was Mechanicville, a beautiful waterfront community on the Hudson River-Champlain Canal. Like many other communities along the canal corridor, the towpath canal used to go right through the center of the town just uphill from the river on what is now Central Avenue. As we spoke to our visitors, most were surprised to learn that the river did not always function as the canal and I decided we needed to try and locate a period photo or drawing to present the correct picture. I went by the fire station after an alarm had ended and spoke to the training officer. He reported that he had some old photos and would send me some and we exchanged e-mail addresses. 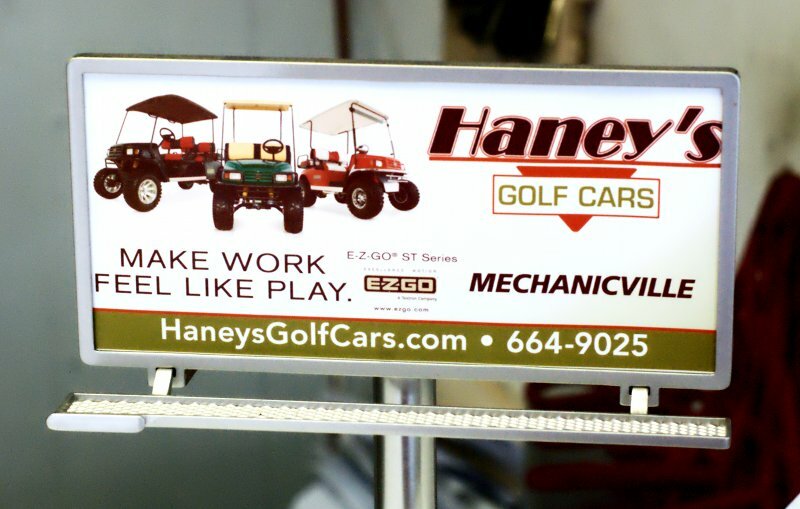 He also suggested I go up to Haney’s Auto shop just a short distance on Central Avenue as they had photos on the wall of the old days that might help. I walked up and spoke to Mrs. Haney who was very willing to let me look at the photographs on the wall, but the key image was a Burleigh lithograph “Birdseye View of Mechanicville” circa 1885 that provided the picture worth 10,000 words. Here was Mechanicville when at least 4-sash and blind factories, a cotton and wool factory and other businesses thrived along the Champlain Canal and railroad center. The Hudson River was the town’s waterfront, but besides an aerial cable ferry to the other side, all the maritime traffic was two blocks up on the Champlain Canal, what is today Central Avenue. 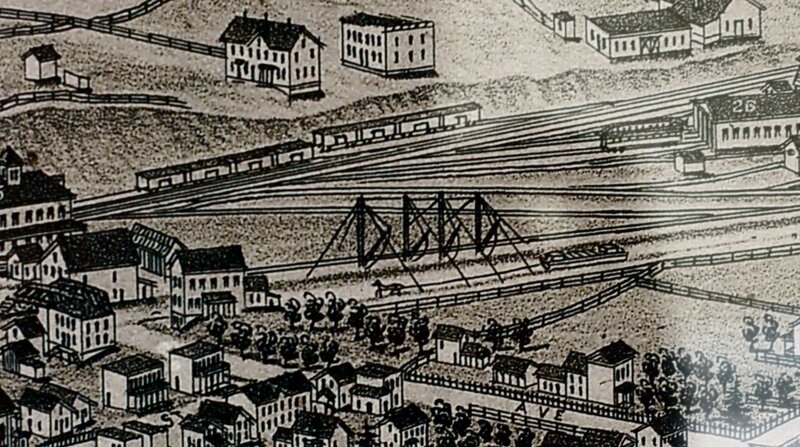 Wooden canal boats were depicted being pulled by horses on the towpath and a line of stiff-leg cranes was strategically positioned next to the canal and connected to the main railroad by a siding. I only wish I had seen the picture sooner so that I could share it with the 200 school kids who had come down to see us during the two days we had been open in Mechanicville. 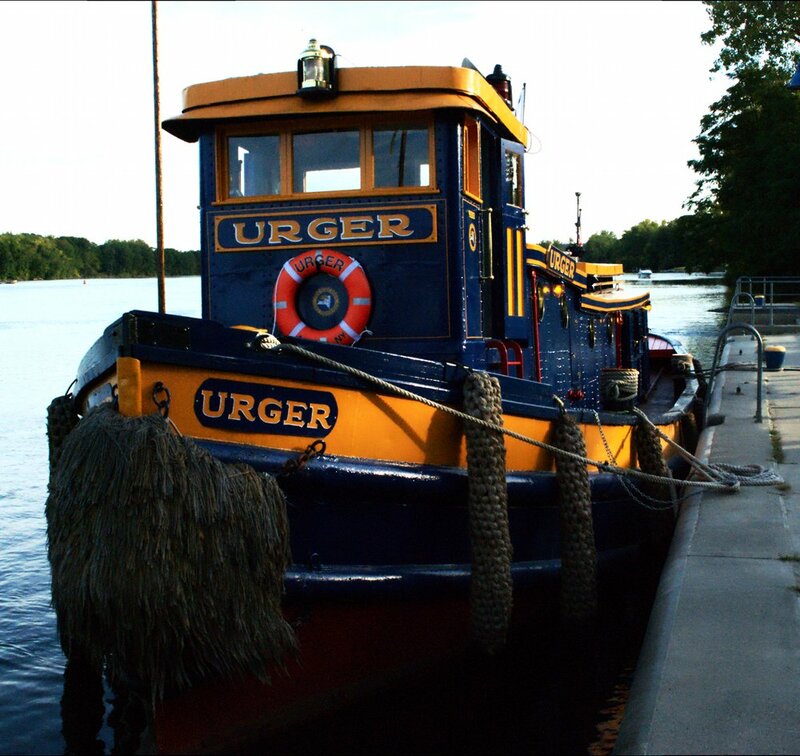 In the aftermath of Hurricane Irene we adapted our schedule and realized that we had an opportunity to develop a new program that involves our Lois McClure and New York State Canal Corporation’s historic tugboat Urger. The Urger, celebrating her 110th birthday this year, was scheduled to travel to the western side of the Erie system when the Irene intervened. We are now combining our two school programs to offer a perspective of the towpath canal era (Lois) and the present Barge Canal era (Urger). The Urger crew is experienced and eager to work with us. A series of planning discussions got the program prototype ready for launching. We each provide learning stations for small groups of students and with 7th graders on Monday and 4th graders on Tuesday you might have thought we had been doing this for years…which of course we have, but not together. Combining the programs in Mechanicville has proved to be a huge success and feedback from the kids, teachers and chaperons was very positive. We were able to provide a richer experience using the two boats and the two crews worked as one to provide a very special field-trip experience for the kids. We are looking forward to seeing more students as fort Edward, Schuylerville and Whitehall before returning to Lake Champlain with stops at Port Henry, Westport, Kingsland Bay State Park, our homeport Lake Champlain Maritime Museum and Crown Point. Hurricane Irene has impacted the region in many profound ways, but when the students arrive at the boats, it’s all about these floating learning platforms and their ability to engage students in history, archaeology, life-aboard, commerce, and water quality. I’ll look forward to letting you know how it goes as we begin to work our way north and to home.